One in every five people in the U.S. has allergies. If you are a physician, you likely see patients with allergy symptoms on a regular basis. Allergies can manifest in many different ways. There are the obvious symptoms: a runny or congested nose, sneezing and itchy eyes. The list doesn’t stop there, though. There are a number of other health problems that can have their root in allergy, including asthma, hives, eczema, chronic sinus and ear infections, chronic cough, conjunctivitis, gastrointestinal problems (from food allergies), eosinophilic esophagitis, fatigue, and headaches. Rather than referring your patients out for allergy treatment and losing continuity of care, consider treating your allergic patients in-house with a turnkey allergy treatment program. You can start by ordering an allergy test kit. Allergy tests are not difficult to administer, and they can enable you to properly diagnose your patients allergies and provide an appropriate treatment plan. There are different ways to test for allergies, including blood testing and skin testing. The American Academy of Allergy, Asthma and Immunology recommends skin scratch testing as the method-of-choice for the most accurate allergy testing. Skin scratch testing is also called puncture testing or percutaneous testing. When you order a skin scratch allergy test kit, it comes with a multi-pronged device. Each prong is dipped into a different allergen extract. The prongs then penetrate the top layers of a patient’s skin. As the test develops, the skin may form red bumps or “wheals” around the penetration spots. The size of the wheals depends on the body’s sensitivity to various antigens. Technicians can learn to administer the tests with about an hour of training. After that, it takes about 15 minutes to test each individual patient. With allergies on the steady rise in America, the need for effective allergy testing will only increase. 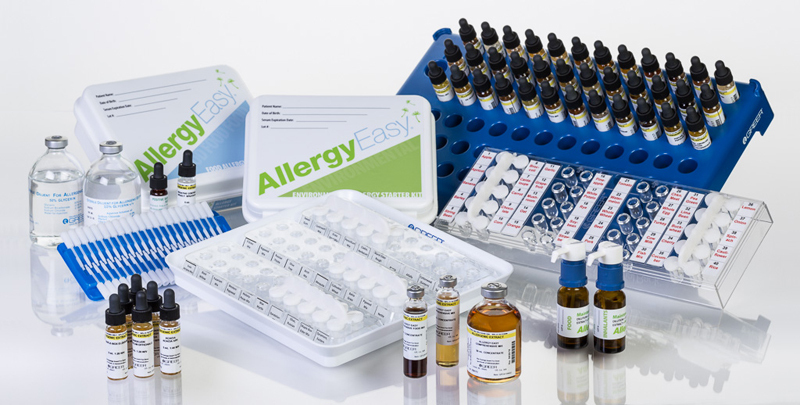 AllergyEasy can help you order an allergy test kit and learn about adopting a turnkey allergy treatment program as well.